A Philadelphia artist has joined a team of scientists mapping the ocean floor off the coast of Baja, Mexico. Rebecca Rutstein, an abstract painter, is using topography 4,000 feet below to inspire her onboard paintings. "My work has shifted from being more landscape based, moving into abstract realms," said Rutstein last week, via satellite phone link aboard the Nautilus. "I'm responding to these incredible maps we're collecting right now." The E/V Nautilus is a 64-meter exploration vessel equipped with two robotic deep-sea divers and an 864-beam sonar system fixed to the hull, taking readings from the bottom of the ocean. "It's a $3 million, 9-ton digital sonar system that used to be classified by the U.S. Navy," said Dr. Robert Ballard, founder of the Ocean Exploration Trust, which owns the Nautilus. "At full speed, it can paint a swath of the ocean floor 7 kilometers wide." The ship is currently mapping the ocean floor from the Galapagos Islands to San Diego, simultaneously dodging remnants of Hurricane Dolores. It's a high-traffic commercial nautical corridor fed by the Panama Canal, but little is known about its depths. "It's a fascinating neck of the woods. Galapagos is a hot spot," said Ballard. "You have a giant welder's torch blasting through the lithosphere from deep within the Earth. A plate moves over the top of it, punching out islands. "In the case of Hawaii, where you have active volcanoes, the torch is burning brightly. It's been going on for tens of millions of years making numerous islands which eventually subside and become underwater sea mounts," he said. Ballard likes to say that mankind knows more about the surface of Mars than Earth's ocean floor. Armed with his Kongsberg EM 302 multibeam echo-sounder and onboard artists, he wants to change that. "We uncovered a canyon with what looks like a former riverbed. We uncovered sea mounts and underwater volcanoes," said Rutstein. "It's amazing to get this visualization continuously -- the live feed of data -- that shows what's beneath us." Rutstein has been given a small room aboard the ship to use as a makeshift studio where she paints canvases inspired by those underwater maps. When the Nautilus is on a diving expedition, that room is used as a wet lab for collected specimens. Hanging near her impromptu easel is a large tubeworm case that had been scraped off the bottom of the ocean. For several years, she has been making work inspired by topography maps. She paints abstracted geometric planes that collide and warp, on top of swirling, smearing color. While aboard the Nautilus, her topographical planes are informed by the echo-sounder. "I visualize the mapping in a 3-D way -- choosing vantage points, and angles, and vertical exaggeration to create visualizations I find compelling," said Rutstein. "Then I superimpose them onto paintings I'm making on the ship." She is not alone. There is a second artist aboard the Nautilus, Karen Romano Young, an author and illustrator of children's books. 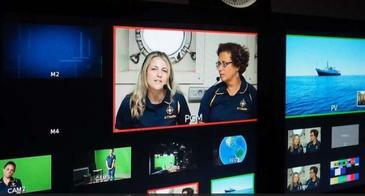 Part of their job as artists-in-residence is educational, explaining ocean mapping to schools and museums around the world connected to the ship via satellite video link. Ballard, whose claim to fame is discovering the wreck of the Titanic in 1985, believes it is important to appeal to the imagination when presenting underwater data to the public. "Imagine standing at the edge of the Grand Canyon in pitch dark. That's most of the underwater world," said Ballard. "What an artist is able to do turn the lights on, and show us what we can't see." Rutstein's renditions of the ocean floor are not painted with an eye for accuracy. As an abstract artist, the 3-D maps are a starting point, spurring her own creative impulses. "For 15 years, I've been inspired by geology, used it as a metaphor," said Rutstein "For me, it's a metaphor for interpersonal relationships. We're talking about rifts and collision and erosion. It started as a metaphor, and I've been riding the trajectory." Rutstein takes inspiration from the geological maps as soon as they appear. The expedition makes its high-definition ocean floor maps available to everyone, online, for free. After the maps are made, the Ocean Exploration Trust uses them to plan deep-sea diving expeditions. "We take suggestions," said Ballard. "The whole oceanographic community has access to these maps, and they know we're going to decide in a meeting in the winter where we're going to go next year."